I am very much enjoying the break that Mother Nature is giving us from the frigid winter weather. Aside from the sloppy mess that it has made of the roads and my pant legs, it is wonderful to be able to go outside for more than 10 seconds without freezing. That being said, time to get on with today’s blog. I have been eating fast food far too often lately. It has gotten so out of hand that I am actually bored of the menu at McDonald’s. For those of you who aren’t aware, I could eat McDonald’s for every meal everyday…. Oh wait I have been doing that for like the last 10 years. Surprisingly enough, I’m not a million pounds and I haven’t died…yet. Yesterday, I decided to step out of my usual routine and try something a little healthier. I went to the Twist Cafe located downtown at 392 Graham Ave here in Winnipeg. It was the first time since moving back to the city that I was took time to enjoy their deliciously fresh prepared menu. 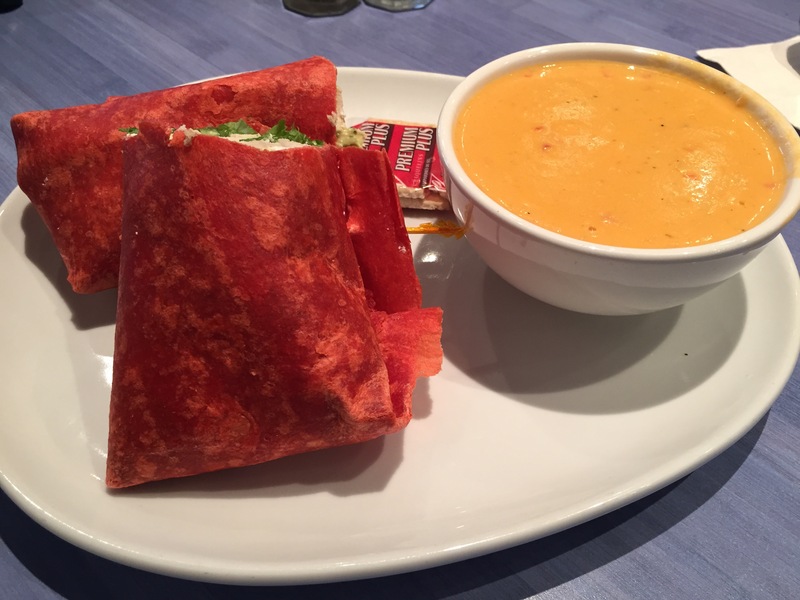 I decided to order the Pesto Chicken Wrap with a bowl of the Lobster Bisque soup. It was the perfect lunch to add the beautifully warm day that we had. The Twist Cafe is amazing for enjoying a healthy lunch with a friend, a business meeting over some fresh pastry, or just stopping in for a coffee and a good book. During the summer, they have a small patio to sit outside and enjoy our downtown. Have you been to the Twist Cafe? Did you enjoy it as much as I always do? Leave a comment below to share your experience. Happy Friday! This entry was posted in Restaurants & Reviews and tagged cafe, downtown, lunch, Twist, Winnipeg. Bookmark the permalink.